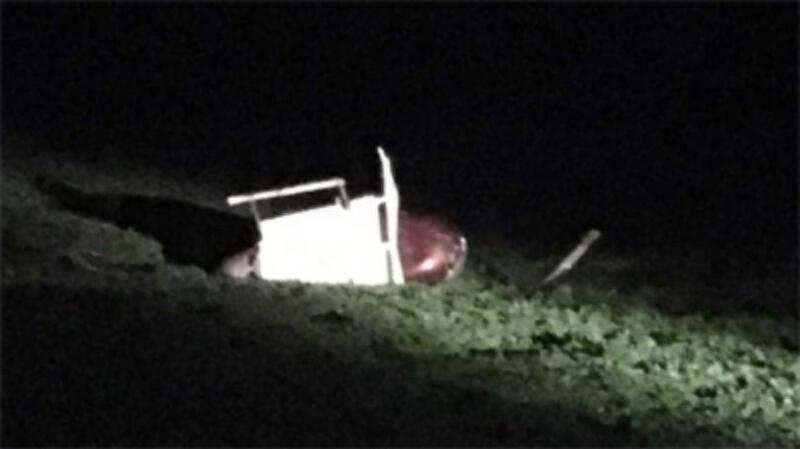 According to the helicopter pilot, he was performing a night agricultural flight. During takeoff from a platform located on top of the tender, his collective application was too aggressive, and during the ascent the engine sputtered. The engine RPM and main rotor RPM decreased, and he tried to regain the RPMs by lowering the collective. The helicopter was moving forward and descending, so he applied aft cyclic to arrest the forward movement, and he attempted to land. The left skid touched down in the soft dirt and the pilot applied aft cyclic to prevent a nose over, but the main rotor blades struck the tailboom. The helicopter rolled forward, and the nose of the helicopter spun to the left before the helicopter came to rest on its left side. The helicopter sustained substantial damage the fuselage, tail rotor drive system and skid tubes. Additionally, the pilot asserted that the accident could have been prevented if he would not have been in a hurry to complete the operation. The pilot reported that there were no mechanical malfunctions or failures with the helicopter that would have precluded normal operation.